This post contains affiliate links. Please read our disclosure for more info. 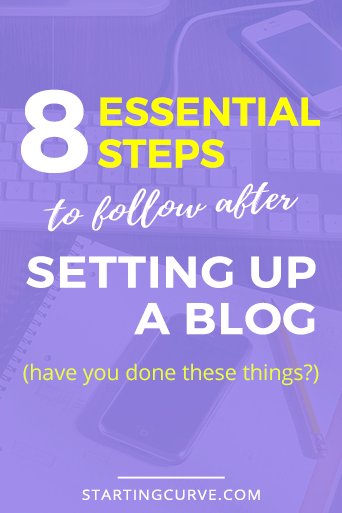 This is Part 2 in our How To Start a Blog series. If you don’t have a WordPress blog yet, be sure to read Part 1 where we show you how to start a blog, step-by-step. For everyone else, grab a snack, pull up a seat and get ready for the fun part: customizing and configuring your blog! So, you’ve just created your new blog. It feels bright and shiny, with a hint of new paint smell. How exciting! A world of possibility lies before you. If this were a house, it would look pretty bare. There’s no carpet, curtains or furniture. Even the front door is without a lock. Clearly, there are some important things needed before you can move in! And just like a new home, your new website needs some setup and customizing before it’s ready for visitors. Not only should it look more welcoming, but it also needs things like… core pages, security and backups, traffic analytics and a way to build your email list. In the following guide, we’ll show you exactly how to set these things up… and more. We’ll walk you through, step-by-step, the way we set up each of our websites and show you the best tools available. Ready to apply those finishing touches? Awesome. Let’s get started! We know just getting to this point wasn’t a walk in the park. You had to choose a niche, brainstorm domain names, find a good web host and install WordPress. Most people aren’t willing to do this kind of work, so congratulations on getting this far! 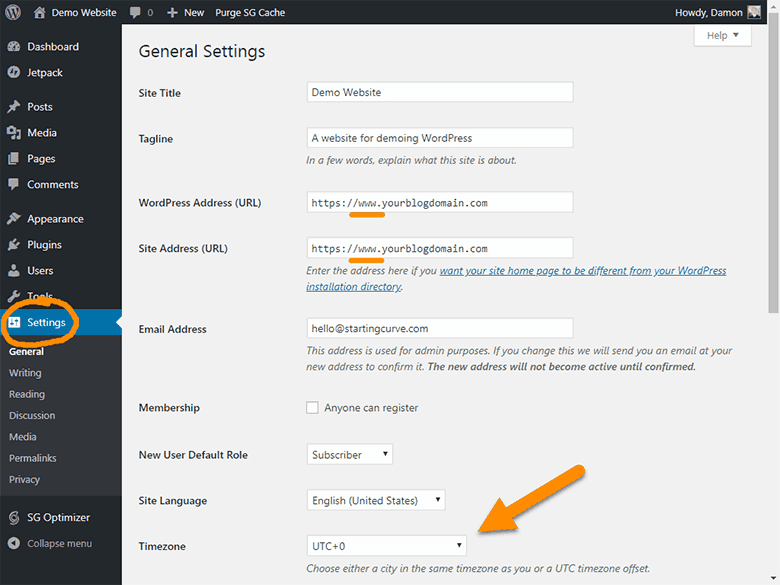 In this first section, we’ll review some basic WordPress settings. This part will be fast and easy – but that doesn’t make it any less important. We’ll begin in the WordPress Settings section. After installing WordPress, it’s important to first check the General Settings. This is where you set things up like your website name, URL preferences, time zone and more. On the side menu, click Settings. Site Title: The name of your website/blog. Tagline: If your theme supports it, the tagline will appear in the header below your Site Title (or near it). WordPress Address (URL): If you want your address to exclude the “www”, you would remove it here. For example, http://yourdomain.com. This is a personal and aesthetic preference. There are no SEO benefits one way or another. If you are undecided, we recommend keeping the “www”. Site Address (URL): 99% of the time, this should match the WordPress address above. Membership: This allows anyone to signup and log into your website. It also opens the doors to a lot of spam, if you aren’t prepared. Leave this unchecked for now. Timezone: Setting your timezone will make things like scheduling blog posts a lot easier. The next area to review is your Permalink Settings. Under Settings, click Permalinks. Permalink means permanent link. It is the unique address (URL) for each blog post on your website. … but more importantly, this will make your website links SEO-friendly. By leaving out the extra details, you are making your post URL more concise and descriptive. Google encourages this because it’s easier for them to understand your topic (and will help your ranking). Google also prefers shorter URLs – as long as they’re descriptive enough. For example, http://x.com/123 tells Google nothing. Compare this to http://backlinko.com/seo-tools which is a great URL because it’s both short and descriptive. Try to use your main keyword somewhere in your post’s title. This will in turn appear in your blog post’s address, which further helps with your SEO ranking. Another area to update is your profile. Click on Users and then Your Profile. 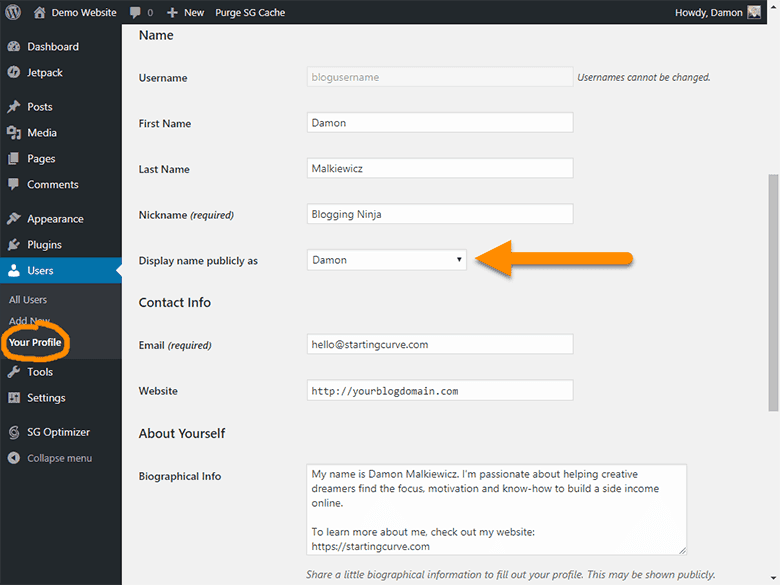 Display name publicly as: This controls how your name will appear on your blog posts. If you are trying to brand yourself as a topic expert, you may want to use your full name; otherwise, using only your first name or even a nickname is OK.
Biographical Info: Some themes and plugins will use this in the author box area, which shows at the end of a blog post. If you’re not sure what to write here, you can come back and add it later. Our final step in this initial setup section is to create your post categories. Your post categories are a useful way to organize your related blog posts into groups. This makes it easier for your readers to find content on your blog. Before getting started, take a few minutes to brainstorm 3-5 categories for your blog. These categories should be relatively broad and fall under your overall niche. We like to think of these as the blog’s primary focuses. You can always come back and add more or edit them later, so don’t get stuck on this step. OK, let’s resume! From the side menu, click Posts and then Categories. Here you’ll see a list of your current post categories. Name: The name of your category. Note that this can be seen by your readers. Slug: A slug? Yes, you read correctly. And we agree – it’s an odd choice for the term. In WordPress, a “slug” is a URL-friendly version of the name. For example, if your blog post was called The Definitive List Building Guide in 2018 then your blog post’s slug could be list-building-guide. 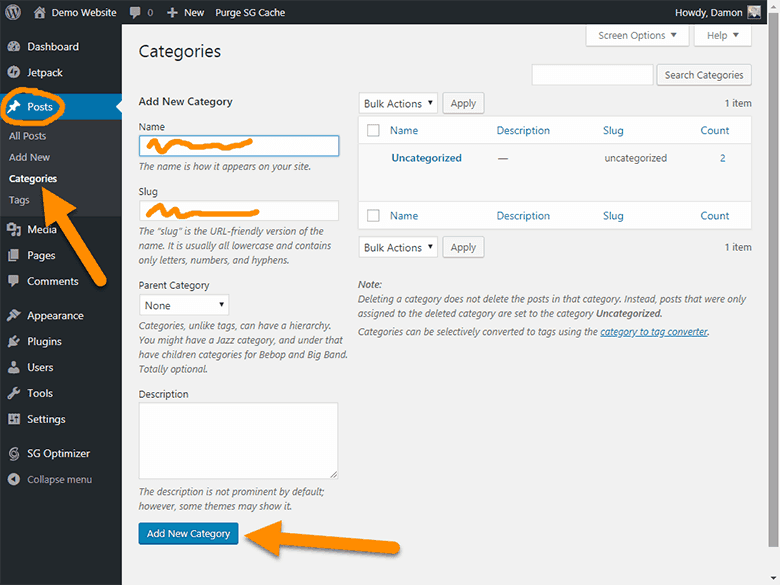 Coming up with your category slug is even easier and usually a matter of replacing any spaces with a dashes. For example, Pinterest Tips becomes pinterest-tips. Parent Category: It’s possible to organize your categories into a hierarchy. For now, we recommend keeping things simple and skipping this. Description: Some WordPress themes will use the description field contents on certain pages. With that said, we typically leave it blank. Afterwards, click Add New Category and you’re done! There’s no limit to how many categories you can add but don’t go overboard. Having too many categories can confuse your readers about your blogging niche and focus. A category called “Uncategorized” is created by default. We recommend clicking on this category and changing it to one of the categories you brainstormed. This wraps up the initial WordPress setup! As you can see, there are quite a few settings and options we skipped. Those are either not necessary at this stage or will be covered later in this guide. In the next section, we’re going to start building the most important pages that every website needs. Here we go! There are a few essential pages every website should have. Some pages help establish trust and likeability with your audience. Others are required by law if you make money from your blog – which is the plan! In this section, we’ll take a look at these important pages and help you build them correctly. Wait a minute. Posts and pages look the same – they even have a lot of the same fields. What’s the difference?It’s a good question, and one that stumbles most beginners.Simply put, a post is your typical blog post entry. They are considered dynamic, meaning they sometimes change after being published (for example, updating an existing blog post with some recent news). Posts can also use tags and categories. A page, on the other hand, is considered static: it doesn’t typically change. For example, think about a Contact page and how seldom that information changes. In addition, pages are not listed by date and don’t use tags or categories. When a visitor comes to your website, there are some key pages they might look for. A reader may want to learn more about your backstory and look for an About Us page. An affiliate may need to get in touch with you and look for your Contact page. Or perhaps Google is visiting and looking for certain legal pages while considering how to rank you. Regardless of who your visitor is, let’s make sure they will find what they need! Your About Us page will probably become one of your most visited web pages. It’s where you want to begin connecting with your readers and guide them towards taking a certain action (such as signing up for your newsletter). Your visitors want to know how you can help them. They’re not thinking about you – they don’t even know you yet. Instead, they want to know if they’re in the right place and if you’ll be able to solve their problems. WHO is your website for? Call your reader out. Identify who you are speaking to. This can be done by telling their story. Address their feelings, goals, desires, struggles, etc. Make it clear that you understand them. WHAT value do you give your reader? You understand what they have now vs what they want, so show them how you can bridge that gap and solve their problems. Explain why someone should read your blog posts and what they will get out of it. Show them your value. WHY is this the right place? Share your story, as it relates to your blog or business. How did you or your website get started – and why? This is where you can begin building rapport and establishing credibility. Call to action. What’s your reader’s next step? Don’t be afraid to tell them exactly what they should do. Don’t worry about crafting the perfect about page on your first try. Besides, your about page will probably evolve over time as you get a clearer understanding of your audience and what you have to offer. A good contact page is a vital part of your website. It shows your visitors how to reach you and can help increase engagement. Certain services even require a contact page. Some websites keep their contact page overly simple. They may write a short greeting and list only a contact email address. While this is OK when getting started, we recommend eventually moving to a secured, contact form. If you list your email address online, you can expect to receive a lot of unwanted emails. Robots crawl the internet looking for email addresses… and they usually end up in the hands of spammers. We use and recommend the popular WordPress plugin called Contact Form 7. It’s quick to install and easy to use. Be sure to see our guide on creating the perfect Contact Us page! We know this isn’t everyone’s favorite topic, but it’s a pretty important one. If you have a website these days, you’re probably going to need one or more of the following legal pages. And if in doubt, we recommend erring on the side of caution and just creating the page. That, or else get legal advice from a professional. An easy way to get an idea about which legal pages you’ll need is to have a look at other websites in your niche. Of course, this is no substitute for legal advice… but if you’re seeing everyone else include a certain page, you’re probably going to need it too! 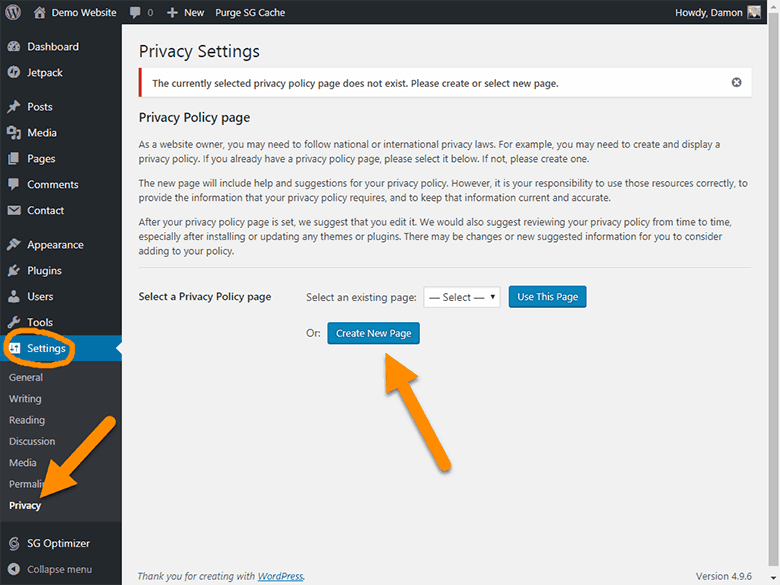 Click on Settings and then Privacy, from the side WordPress menu. This will take you to the Privacy Settings screen. At the top of this new page, there’s a link to a privacy guide created by WordPress. It may not be the most exciting thing to read, but we recommend clicking the link and reviewing. A disclaimer is needed to protect yourself legally. The basic idea is to inform your readers that you can’t be held liable for your content or links. Additionally, if you’re going to promote any products or services using affiliate links on your website, you’ll need to disclose this too. The FTC requires you to inform your readers and provide a link on every webpage to this disclaimer. We include our disclaimer in two locations: above each blog post and at the bottom in our footer section. Feel free to look at our disclaimer for an idea of what’s included. A terms of service agreement is not required by law. It’s optional. That being said, having one is rarely a bad idea. It’s there to protect you from readers who do anything inappropriate, like infringe on your copyright. Basically, it sets the expectations you have for your users – as in, what’s acceptable – and what your users can expect from you. It spells out the rules a user must agree to if they choose to use your website. Shopify has an excellent terms of service generator that’s completely free. While it’s probably overkill for your blog’s needs, you can start with it and cut out those parts that don’t apply. Congrats on making it this far (and for getting through the legal stuff 😉 )! In the next section, we’re going to walk you through the process of installing a WordPress theme. This is where things start to get fun, so don’t miss out! At last! The part everyone’s been waiting for! Installing a theme. Yeah! Your WordPress theme is what gives your website its overall look and appearance. It’s like your interior design – but rather than carpet and curtains, your theme controls things like the fonts, color scheme, and layout. But before we grab the paint brushes and get busy, we should consider our end design. We need to choose a theme first! Using a bad theme can come back to haunt you for some time. Yes, let’s try to avoid that. OK, don’t actually close your eyes. You’ll need those. If you’ve never installed a theme before, you’ll see how simple it actually is! Start by clicking on Appearance on the side menu. 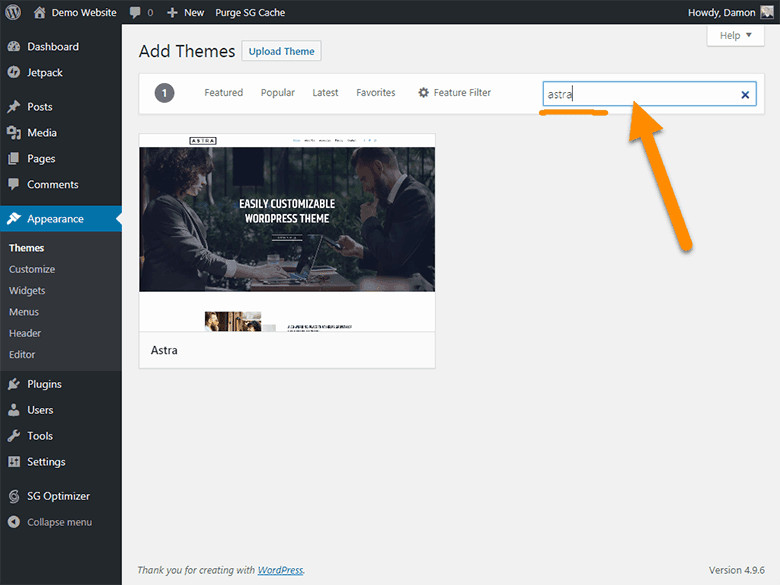 This will take you to the Themes page, where you’ll see all the WordPress themes currently installed on your website. There’s a difference between a theme being Installed and a theme being Active.When you initially Install a theme (or a plugin), it copies the files to your website but it remains in an Inactive state. It will remain Inactive until you click the Activate button.Also to clarify, a WordPress website can have only one Active theme but many Active plugins. 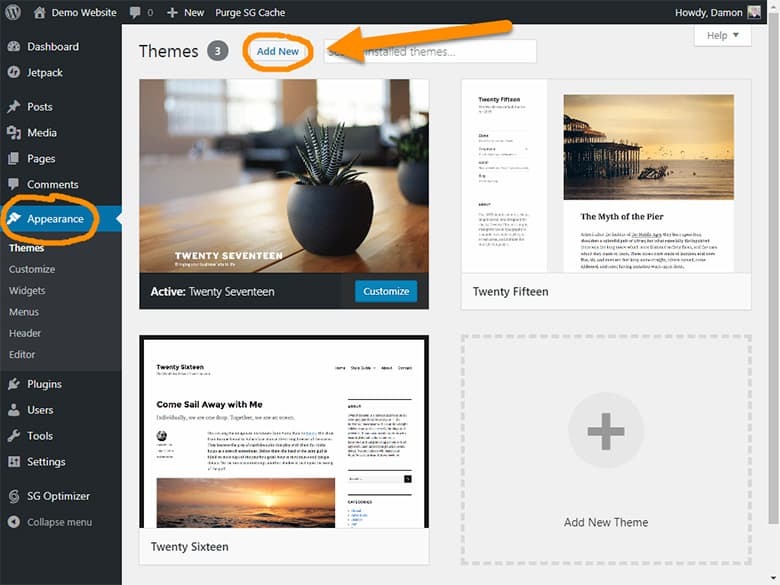 WordPress comes bundled with several official themes. They have names like “Twenty something”, as seen in the picture below. So if you notice some themes already installed, know that this is to be expected. This takes you to the Add Themes screen. 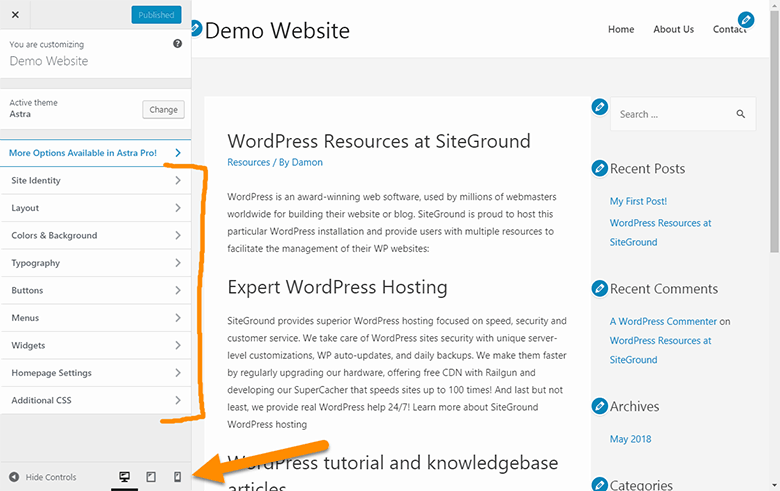 From here, you can browse through what they call the WordPress theme repository. The theme repository is basically a big, online collection of themes (and plugins). There’s a lot of good themes here, especially under Popular. But if you intend to make money from your blog, you’ll want to use a premium theme from the start. Theme selection is a pretty important topic. We even wrote a guide on it, including our recommendations. (article coming soon)The two themes we do recommend are Astra and Divi. Here’s a brief summary of their pros and cons:Astra is the fastest WordPress available. 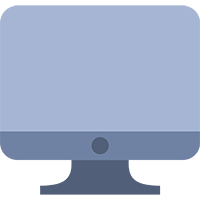 It’s cleanly coded, SEO optimized, free to get started with and includes a library of pre-built websites (so you don’t have to start with a blank slate). On the other hand, it might not be for you because its user interface is not as fun/pretty as Divi, is not an all-in-one solution and some advanced customizing can get technical. Divi is one of the most popular themes ever – especially with bloggers. 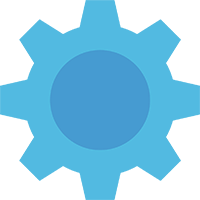 It’s fun to use, has a huge community following (tips, tricks and help videos are everywhere) and includes everything you need in one package: theme, social media, email opt-in, page builder and split testing. The biggest trade-off is, Divi makes it difficult to change your website theme in the future. Also, being an all-in-one solution is convenient but at the expense of speed/performance. You can test each of these themes risk-free. Astra is free to start and Divi includes a money-back guarantee, so try them out and see which is the best fit for you. To clarify, you’ll only find free and freemium themes in the theme repository. To find a premium theme like Divi, you’ll have to purchase it through the theme’s website and install it a little differently. Don’t worry – it’s pretty easy too. More on this shortly. Move your mouse cursor over the theme picture. You can view details about the theme and see a live preview of how it will look on your website. Don’t be disappointed: your website will probably look bad in the live preview. They always do. This is because you’re seeing the theme without any settings customized yet. That part will be coming up soon! When you’re ready, click Install. After you buy a theme, you’ll be emailed access instructions. Follow those instructions to download the theme to your computer. 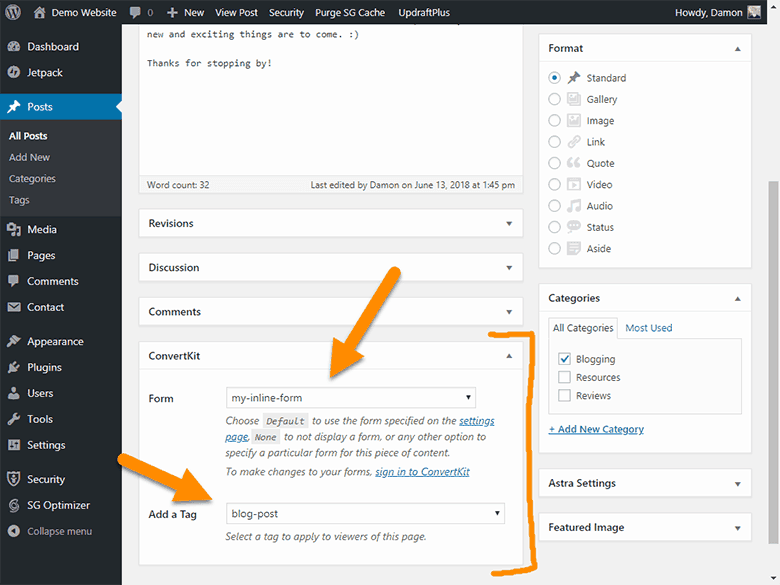 From the WordPress Add Themes page, click the Upload Theme button. A new section will appear below. Click Choose File, navigate to where you downloaded your theme and select it. WordPress will do its magic and a few moments later, you’re premium theme will be installed! With your new theme installed, all that’s left to do is click the Activate button to activate it. Way to go! Your theme is live and ready to be customized! In the following section, we’ll look at customizing your theme and website appearance. This is where you’ll be able to separate yourself from the pack and let your website’s personality shine. Your website design is like a job interview. You need to make a good impression on your visitors if you want them to come back for more. Good visual design – Make good use of white space, consistent brand colors, fonts that pair well and readable font sizes. Simple navigation – Make it easy to find your content. Don’t go overboard with header, footer and sidebar links. Keep things simple and organized. Mobile compatible – More people are browsing on their phones today and so it’s key that your website works well on mobile devices. WordPress has features that make testing and tweaking for mobile easy. In addition to these basic principles, your design should speak to your target audience. For example, a wedding photography blog will use certain styles and have a different look than a surfing lifestyle blog. 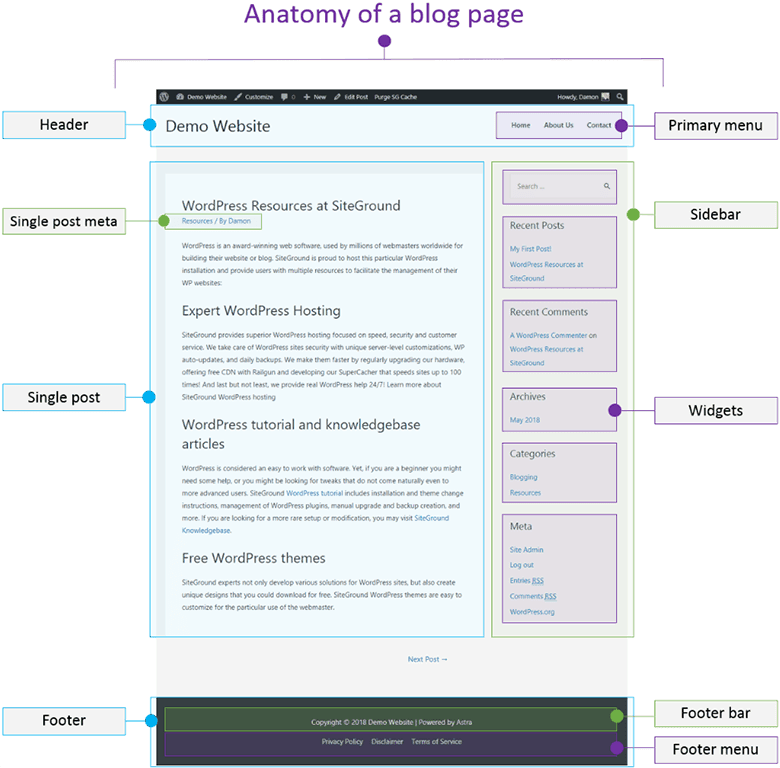 Most blogs have a similar, underlying structure. Train yourself to look for these elements at your favorite websites and it’ll help you build better website designs yourself. The easiest way to customize your website’s appearance is by using a fantastic tool called the WordPress Customizer. 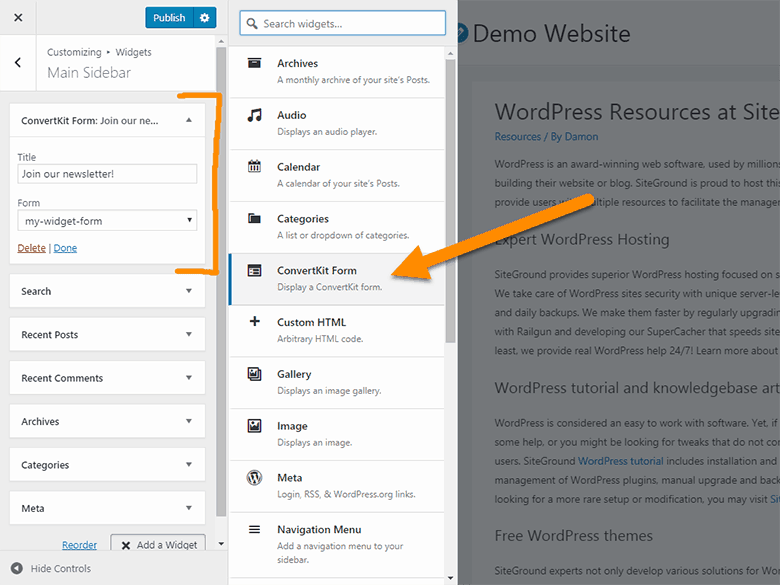 From the WordPress side menu, click Appearance and then Customize. If you are thinking about upgrading your Astra theme to the Pro or Agency version, click here FIRST to see our exclusive bonus offer. The Customizer is an editor for your website’s appearance settings. Using this single interface, you can changes things like your page layouts, menus, sidebar widgets, color scheme, and fonts. You can see how your website will look on tablets and phones by clicking one of the device icons on the bottom-left. What makes Customizer so awesome is that you can see your changes in real-time! You can see your updates as you make them. It’s a great way to play around and experiment with your design. And don’t worry – those changes won’t be applied to your real website unless you click Publish (at the top). While exploring WordPress, you may have noticed some Appearance options, like Widgets and Menus. You’ll find those inside the Customizer too.Don’t let this confuse you. They’re just different ways of changing the same thing. Both will yield the same result.The Customizer was first introduced to WordPress in version 3.4. Before that, you had to use those other options for customizing, which were scattered around various areas. One of the aims of Customizer was to simplify things by putting all those appearance settings in one place! Every WordPress theme will organize its theme settings differently inside Customizer. This is one of the reasons we love Astra and Divi so much: their settings are organized in a simple, intuitive way. You probably see all your pages listed in the header – including the legal pages. 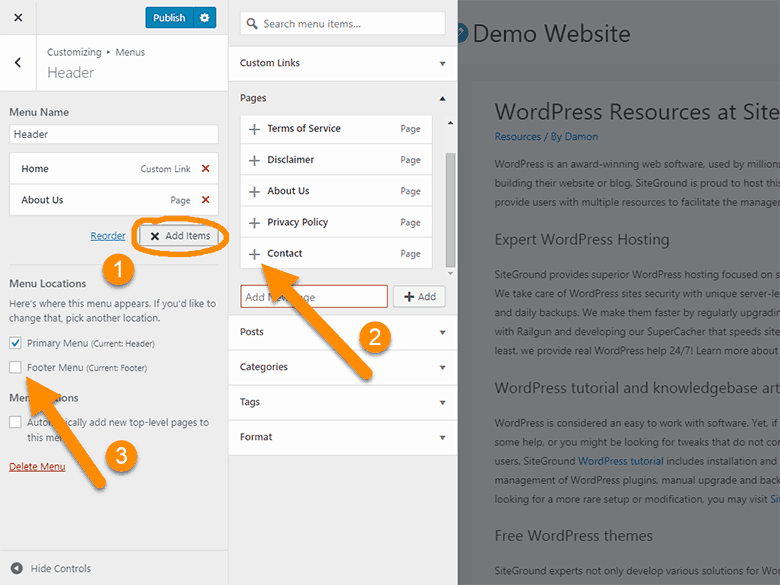 To change this and control which links appear where, you have to create WordPress menus. When you create a menu, you select which pages, posts or even categories to include. After you build the menu, then you indicate whether it’s a Primary Menu or Footer Menu. A sidebar is made up of one or more widgets. A widget is a small block that performs a specific function, such as a search field or a list of your blog categories. You create your sidebar in a way similar to creating a menu. Also, each widget will have properties that can be customized after adding to your sidebar. Your sidebar is valuable real-estate. Try to keep it simple and don’t go overboard filling it with ads. Each widget should serve a specific purpose. For example, use a picture of yourself to help create trust, add a list of your categories to help readers find content and include a newsletter signup to build your email list. When a reader visits your blog, what will they spend most of their time doing? Reading your content (hopefully)! This means font selection should be a pretty high priority. Sadly, a lot of website owners leave it as an afterthought. Font size: The purpose of your content is to be read, so why not make it as easy as possible? Don’t let a ‘pretty’ design persuade you into using small fonts. Nobody likes to squint to read something. Fonts that are too small are a good way to chase people away. Font pairing: There’s a lot of fonts out there; however, they don’t all pair well. Your font choice matters because they have different levels of readability, convey different types of personality, and speak different messages to your readers. We recommend reading more about the science and psychology of typefaces. In the meantime, try using a tool like Font Combinations (full page mock-ups) or Font Pair to get ideas and inspiration for your blog’s fonts. Also, be sure to see our top 10 font combinations for 2019. Much like your website’s fonts, your color scheme plays an important role in the messaging you convey to your readers. Different colors and combinations create different statements and feelings. 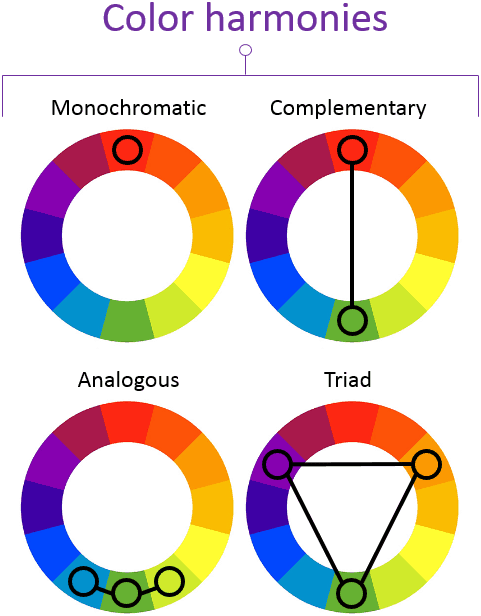 Simply put, don’t just pick a bunch of your favorite colors and be done with it. To get started thinking about your own color palette, we recommend visiting some of your favorite blogs and noticing their color choices. At this point, your blog is starting to take shape. You’ve completed the initial setup, created those essential core pages, installed your theme and began making it unique to your brand. So many give up and quit before even getting to this stage. Let’s keep the momentum going and continue to the next section where we look at ways to protect your website from unwanted visitors. The core WordPress system is already a pretty secure platform. It’s backed by a billion-dollar company and security is one of their primary focuses. With that being said, 30% of the websites on the internet now run WordPress – and that makes it a HUGE target for hackers. But keeping the bad guys out doesn’t have to be so difficult. Some simple precautions can go a long way. To start, let’s think about security on two levels: server level security and software level security. The best security begins with a good web host company. They’ll do a lot to block or prevent hackers long before they arrive at your front door. Your hosting company is responsible for the security of your website server. They will use technologies like firewalls, intrusion detection and account isolation to layer on the protection. They’ll also keep your server software up to date, which is vital for fixing bugs and patching security holes as they’re discovered. This is why it’s smart to avoid low budget web host companies: their security may be low budget too. They might save you a few bucks now but they’ll cost you in the long run. Daily backups. In case something does happen, your website can be restored quickly. 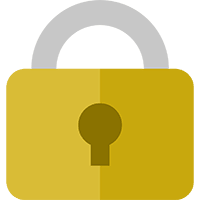 Free SSL certificates. SSL isn’t just for credit cards. It protects the sending of all data between you and your visitors. In addition, it’ll give your SEO a boost, increase your trust and credibility and improve website performance (HTTP/2). Free CloudFlare CDN. A content delivery network will help prevent denial of service attacks and block bots and other bad traffic. In addition to blocking this traffic before it arrives at your website, a CDN will also improve performance. Malware monitoring service. For added peace of mind, SiteGround offers a malware detection and early warning system. It costs extra (less than $2/month) and will monitor your website daily for hacks, infection, and blacklisting. While server-level security will go a long way to protect you, there are some safety precautions you should take on your WordPress site as well. Your website is only a secure as its weakest link. You can have a great web host with the best server-level protection and still be extremely vulnerable to attack. Outdated software. Just like your car, your website needs occasional maintenance. WordPress will do some of the work for you and automatically update itself whenever a minor update is released. For major updates, you’ll need to update manually. WordPress can be configured to automatically install major updates too; however, we don’t recommend this. A major update includes more significant changes and has a greater chance of breaking something on your website. We recommend a manual update so if something does break, you know immediately. In addition to WordPress core updates, your theme and plugins will need to be kept up to date as well. Bad themes & plugins. Poorly coded themes and plugins can open your website to hackers. The same is true of abandoned themes and plugins because the author no longer fixes bugs and security issues.Your best defense against these kinds of problems is to be highly selective about which extensions you use on your website. When viewing a theme or plugin inside the WordPress repository, pay attention to things like review rating, number of active installs and when it was last updated. You can even read reviews by clicking More Details and then selecting the Reviews tab. Weak passwords. Did you know that 123456 was the most common password in 2017? And the second most common password was 123456789?Don’t be one of these people. Passwords today need to be tough. Use a mix of letters, numbers and special characters. Upper and lowercase. It should be at least 8 characters but we recommend longer (and use a password manager if necessary). Don’t let your website become vulnerable for any of these reasons above. In addition to the precautions above, we also recommend using a WordPress security plugin. Doesn’t slow down your website. Comprehensive suite of security features. Takes part in a brute force attack network. This means when an attack is detected somewhere around the world, it reports the details to everyone using this software to proactively prevent a similar attack on your website. After installing, click Secure Site to use the easy 1-click security option. When it prompts you, click Activate Network Brute Force Protection. If you were to stop here, you’d already be ahead in the game. Your website has strong security and able to deal with most attacks. But the truth of the matter is, no security solution will ever be 100% secure. And this is where backups come into the picture. Having a solid backup plan should be a part of your overall website security plan. They are absolutely necessary these days – and not just for security reasons. When people think about their website and worst-case scenarios, they often think about hackers. If they have a good web host and basic security, then their thinking stops here. But what if an update goes wrong? Or a virus, trojan or other malware infects your website server? Even the strongest security can’t protect you from these things. However, a backup can! For these reasons and more, we recommend having a personal backup strategy. To clarify, this is in addition to the daily backups your web host is performing. 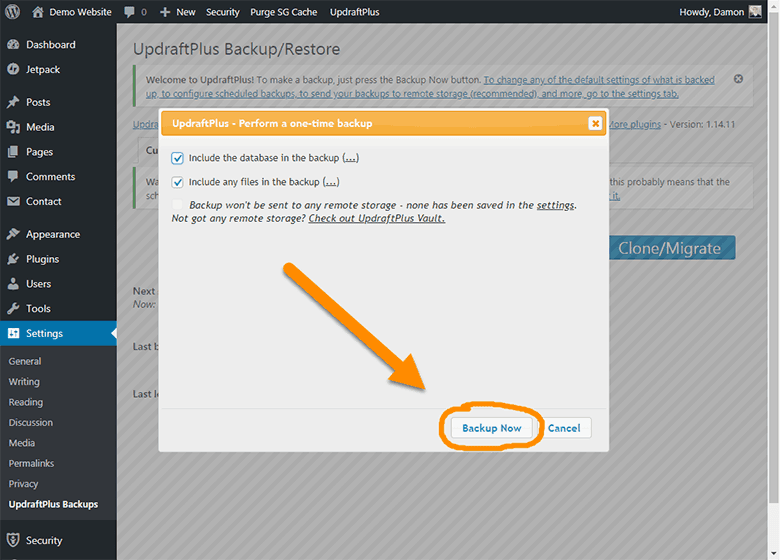 After UpdraftPlus is active, go to Settings and then UpdraftPlus Backups. 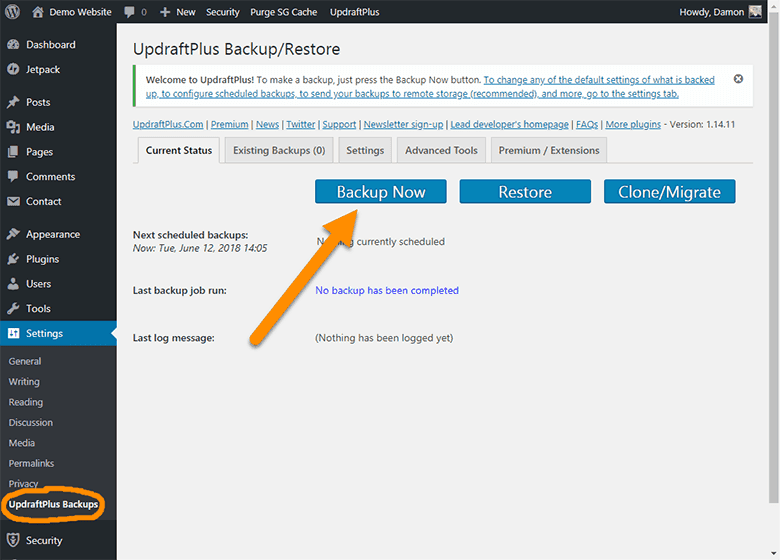 A popup will appear asking what to include in the backup. You can leave the default options for now, as shown in the picture below. Click the Backup Now button. After the backups complete, click on the Existing Backups tab. This will show you all the backups you’ve created. For now, just click each of the backup data buttons (Database, Plugins, Themes, Upload and Others) and download to your local computer. 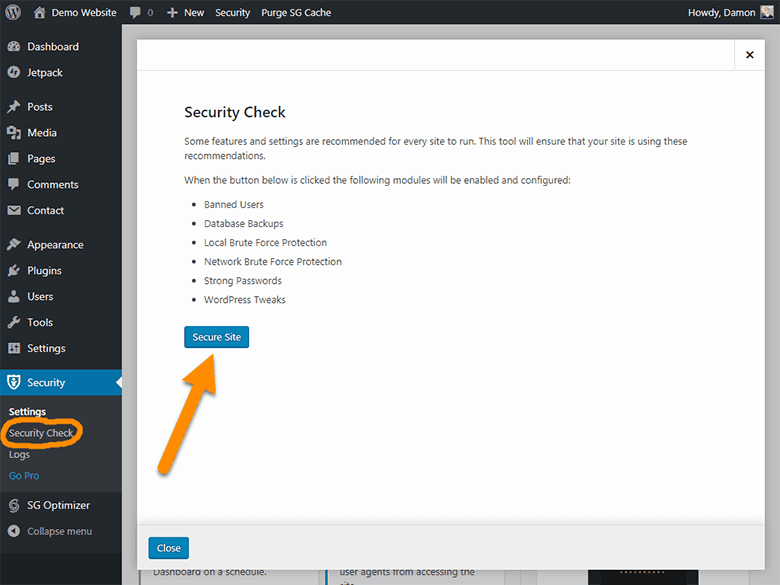 If you’ve installed iThemes Security using the 1-click Secure Site option, a database backup feature is enabled. While the iThemes backup option is OK, it’s far from comprehensive. We usually disable this option and use UpdraftPlus exclusively. Congratulations! Not only do you have a highly secure website, but you’re also protected in case something bad does happen. In the next section, we’ll take a look at web analytics and setting up tracking on your website. After you launch your new website, wouldn’t it be nice to know something about your visitors? For example, who are they, how did they find you and what are their favorite posts? Beyond just satisfying your curiosity, having data like this to analyze will help you make better decisions. You can understand what’s working and what’s not. You can learn more about your audience and their preferences. You can get ideas about what content to create in the future. Having analytics software on your website is essential. We recommend using Google Analytics, which is a free, web analytics service offered by Google. It’s an incredibly powerful tool that gives you a ton of insight into your website traffic. With great power comes… great complexity? 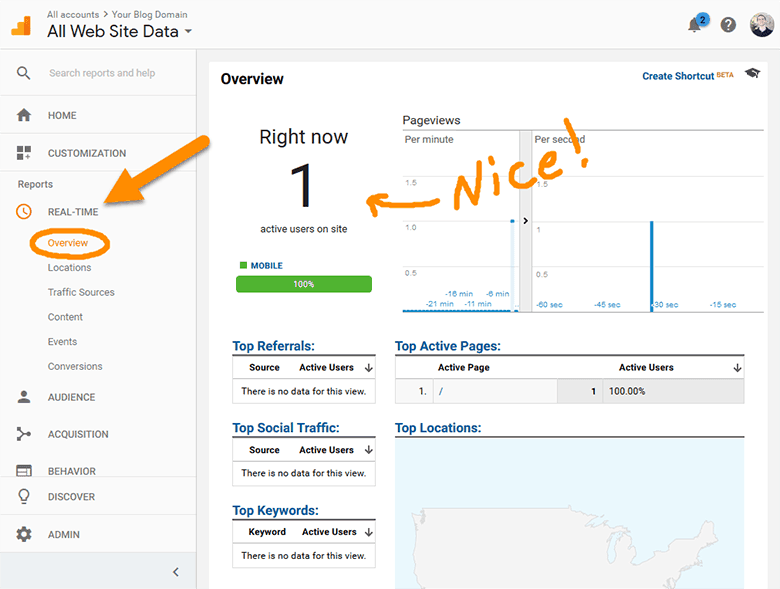 At first glance, Google Analytics can seem pretty overwhelming. Even after using it for years, we still find certain parts confusing. But like learning anything new, you can start small and just focus on one part at a time. 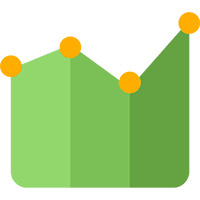 The most important thing at this stage is to just connect Google Analytics to your website. It’s necessary to start collecting data as soon as possible – even if you don’t understand how to interpret that data, yet. Click here to go to Google Analytics (link opens in a new window). Sign in to your existing Google account (or create one). Enter an Account Name, Website Name, your Website URL and select your Time Zone. Under Data Sharing Settings, check or uncheck any options you like. We typically uncheck everything. Google’s Terms of Service Agreement will appear. Click I Accept. Afterwards, you’ll be taken to a screen that shows a Tracking ID. The Tracking ID is in the format, UA-XXXXXXXXX-X. Copy this ID because we’ll need it again in a few minutes. 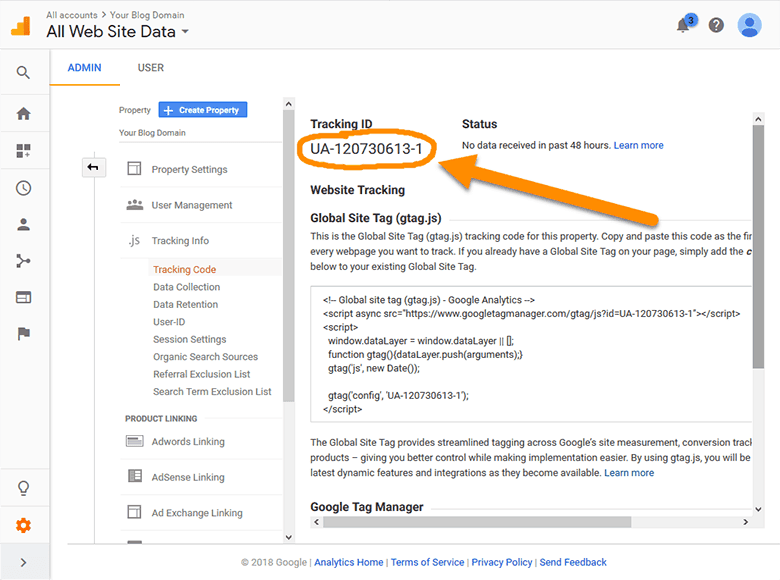 Most WordPress themes, Astra and Divi included, have an area where you can install your Google Analytics tracking code. Quick and simple. Our preference, however, is to use a dedicated plugin for this. A plugin can have some significant advantages over the simple options offered inside a theme. Better tracking options. In particular, you want to exclude yourself from your analytics data so you don’t skew any results. Better privacy. Anonymizing your visitors’ IP addresses is a considerate thing to do. It provides better privacy protection for your website visitors from Google. Better performance. When someone visits your website, the web browser will make a round trip to Google’s servers and downloads the tracking script – every single visit. A better way is to store this script locally, which makes your website load faster. Set and forget. If you install your tracking code in your theme and change themes in the future, you risk forgetting to re-install your tracking in the new theme. With a dedicated plugin, your tracking code will be always be installed – even when changing themes. Enter your Tracking ID into the first field. You can choose whether to check the Use Anonymize IP option or not. Afterwards, click Save Changes. Done! Your tracking is installed and should now be collecting data. 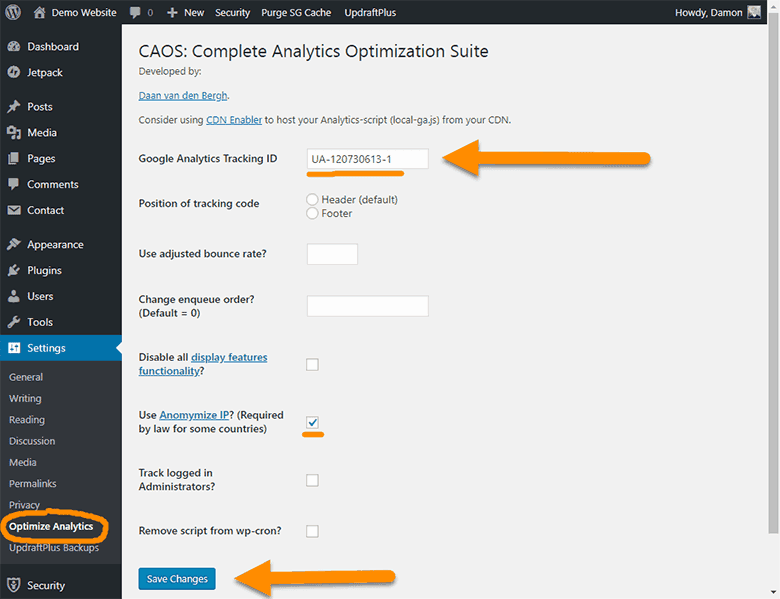 To test, log back into your Google Analytics account. Under the Reports section, click on REAL-TIME and then Overview. Now, using your phone, temporarily turn off wifi (so your phone IP address is different from your computer IP address) and then open your website. You should see 1 active user currently on your site. With web analytics set up and collecting traffic data, you’re ready to move on to one of the most important aspects of your blog: email list building. But in order to do this, we have to first connect an email service. Do you know the most common regret of many bloggers? They wish they’d started building their email list sooner. In this day and age, many may think email is archaic. With social media and instant messaging everywhere, why bother with such an “old” form of communicating? Email is personal. Unlike a piece of content in your newsfeed, email is direct one-on-one. People read it in the privacy of their email inbox. This type of intimate communication is engaging and helps build trust with your subscriber. Understand your readers. Who’s reading your blog, what are their challenges and how can you help? Interacting with your email list subscribers can also help answer these critical questions. People check email daily. You can probably go a couple days without checking Instagram, but how many times do you check your email – each day? You own your email list. You might be making a killing on Facebook but what if Mark Zuckerberg changes the rules? Or if Pinterest bans your account? Or your affiliate network shuts down? In the world of online business, your email list is one of the few things you actually own or can control. Email subscribers buy products. With social media, people tend to be pretty relaxed about who they follow and vice versa. Email, on the hand, is sacred. People hate spam. If someone opts into your email list, they have a genuine interest in hearing from you. And someone who already likes you and your business is likely to buy from you too. In summary – even today, email just works! Sounds great, but how do you start building your email list? 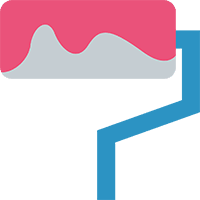 There are a lot of email services available today – and we’ve worked with a large number of them, including: ActiveCampaign, AWeber, Benchmark, Campaign Monitor, Constant Contact, GetResponse, iContact, MailChimp, MailerLite, SendinBlue and SendReach. While many of these provide a good service, the email service we currently use and recommend is ConvertKit. It’s one of the most popular email services in the blogging community and we can see why. Easy to use. They make everything about email capture easy, from creating forms to setting up sequences. Powerful automation. Their marketing automation is so, so simple. Everything is well thought-out and intuitive, while also powerful and flexible. High deliverability. We’re not sure what type of sorcery they’re performing behind the scenes, but we rarely have trouble with our emails being delivered! Smart design. Did we mention we absolutely love their user-interface? Their founder was both a blogger and designer. Both of these traits carry over into the service. Subscriber-centric. ConvertKit is subscriber-centric which means you have only one list that is organized using tags and segments. Other services over-complicate this. Tons of integrations. We haven’t found a tool yet that wasn’t compatible with ConvertKit. Get your first 14-days with ConvertKit free by clicking here to sign up. You don’t even need a credit card to give it a try. Included is a risk free, 30-day money-back guarantee. 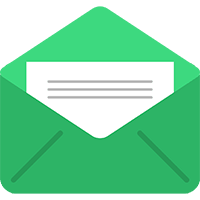 If you need to use a free alternative to get started, we recommend MailerLite. Of the free tier email services, it was our favorite. You’ve got mail an email service. What’s next? There’s no doubt you’ve seen these before. They are the pop-ups that appear when visiting a website, the newsletter sign-up in a sidebar and the in-content freebie you trade your email address for. These forms can be created inside your email service or by using a dedicated plugin. A dedicated plugin will offer more features and customization; however, for the sake of simplicity, we recommend creating your first opt-in form using your email service. Afterwards, go to Settings and then ConvertKit. There is a one-time setup step that’s necessary. You need to authenticate your WordPress website for use with your ConvertKit account. This is a safety precaution to protect access to your account. Click the link titled, Get your ConvertKit API Key (step #2 in the picture below). This will open your ConvertKit account page in a new window. Copy and paste the two fields: API Key and API Secret. Click Save Changes and you’re all set. The ConvertKit plugin creates a new sidebar widget. To use, first add the ConvertKit Form widget to your sidebar. Next, give it a title and select the form you created inside ConvertKit. 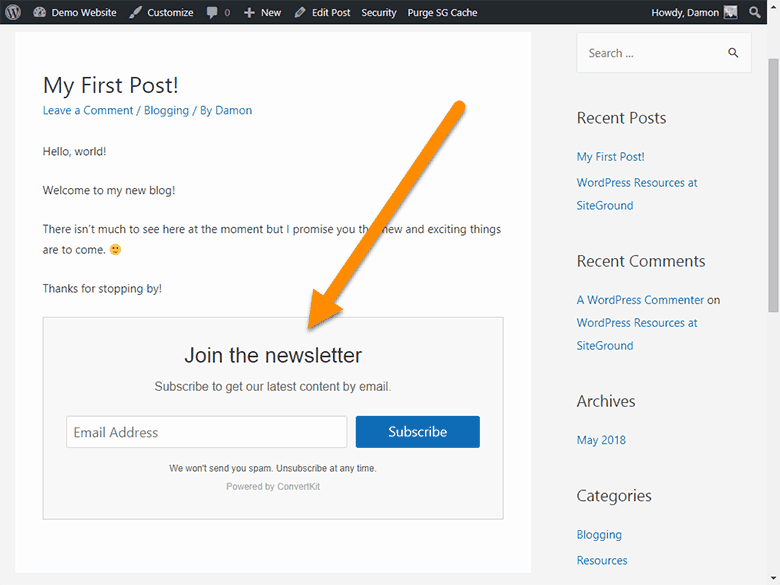 A good place to ask people to join your newsletter or sign-up for a lead-magnet is inside a blog post. Because a reader is already engaged with your content, they are more likely to opt-in. The ConvertKit plugin creates a new settings section inside each post and page. To use, simply select the form you already created inside ConvertKit and optionally select a tag. Tags are a smart way to organize your subscribers based on actions, interests or more.For example, if people opted in on a post about vegan recipes, those same people might be interested in knowing when you publish your vegan cookbook.Being able to identify this group of people inside your subscriber list is therefore quite valuable! Afterwards, click Publish and your opt-in form is live! The final place to display your opt-in form is everywhere on your website. This is ideal if you choose to display a modal popup or slide-in form. To set this up, go to Settings and then ConvertKit. Set Default Form to this form you created inside ConvertKit. For sitewide opt-ins to work properly, you must create a ConvertKit form with the Form Style set to either Modal or Slide In. This is found in the ConvertKit form Settings area. Click Save Changes and your sitewide opt-in form will be ready to go! Congratulations! You’ve just set up one of your most valuable business assets. In the final section of this blog setup guide, we’ll look at some other plugins that could really benefit your blogging business. WordPress may be the powerful engine driving your website, but what takes it to the next level are plugins. As you have seen, plugins are what gives WordPress its true flexibility. In this section, we’ll briefly look at an assortment of plugins we sometimes use on our websites. As they may or may not apply to your specific needs, feel free to pick and choose as you like. Akismet Anti-Spam – If you’re going to allow comments on your blog, you’re going to want some form of spam protection. Akismet offers a free service but does require registering an account to use. It works by running your blog comments through their global database to determine if a comment is spam or not.UPDATE: We no longer recommend Akismet for spam protection. 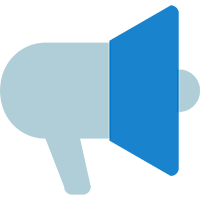 WP-Spamshield – Our go-to anti-spam plugin of choice is WP-Spamshield, a fast and lightweight plugin that runs on your server (non-cloud based). What makes it stand out is how it protects against spam everywhere on your website, including comments, contact forms and elsewhere. It’s also invisible to your visitors which means no more slow and annoying CAPTCHAs and challenge questions. As a premium plugin, it does require a one-time purchase but is quite reasonable, especially compared to the popular Askimet and its $60/year subscription. Elementor – The best page builder available for WordPress. When you develop the need to build more complex layouts and designs, such as an advanced home page or product sales page, you’ll want to take advantage of a page builder like Elementor. What was once the realm of custom coding can now be achieved using drag-and-drop. You can try Elementor for free and upgrade to their Pro version if the need arises.Note: If you purchased the Divi theme, you do NOT need Elementor. The Divi theme includes its own page builder called the Divi Builder, which is also quite good! Shortlinks by Pretty Links – This handy little plugin lets you create shortened links on your own domain. You can group these shortlinks, manage them from one location, see click details and view other reports. For bloggers, it’s a great way to clean up your affiliate links and look more professional.Shortlinks will also save you time and headache if updating a commonly used URL. For example, imagine you create a shortlink like http://yourdomain.com/recommended and use it in many places across your blog and social media. If the destination URL of your shortlink ever changes, you only need to update the one shortlink in one place! Simple Author Box – An author box is kind of like a mini “About page”, commonly shown at the end of a blog post. It helps to build brand awareness while also looking professional. This simple plugin creates an author box for you and includes some nice options for customizing. We like that it’s easy to use and looks great straight out of the box. That being said, this is definitely an optional plugin. Social Warfare – There are a ton of social media plugins out there but our favorite is Social Warfare. It’s easy to use, includes attractive (and configurable) share buttons, does a lot of behind-the-scenes analytics, and displays your share counts in cool and creative ways. Basically, it includes everything you need to start ramping up your social traffic! There’s a free version available but we recommend purchasing the Pro version to gain access to all their best features. Yoast SEO – Search engine optimization (SEO) is a topic that intimidates many yet is critical to your success with organic traffic. If you ever plan on being found on Google or Bing, you will need to optimize your website for SEO. Our go-to plugin of choice is Yoast SEO. Their free version covers all our needs from sitemap creation to title and meta descriptions. It even includes a configuration wizard that walks you through the setup process, step by step. Of the plugins listed above, we consider WP-Spamshield, Social Warfare and Yoast SEO the most necessary. Avoiding spam is always a priority. And after launching your website, your focus is going to shift to traffic and promotion. Consider these plugins to help you with the heavy lifting. There’s one final category of plugin we haven’t touched on yet: performance and optimization. However, this topic is so important that it deserves its own guide. For those of you who made it this far, we really want to congratulate you. You’ve come a long way! When you started this guide, your website was looking rather bare and uninviting. And now, you have a fully furnished and finely tuned business building asset. You are well on your way to success with your blog! We hope you learned a lot – and more importantly, we hope you apply this knowledge. If you found this guide useful, we have one request for you: please PIN THIS or share it with someone you know. It helps us and it helps them. Win win! We’re here to help. Leave us a comment, tell us where you’re struggling. 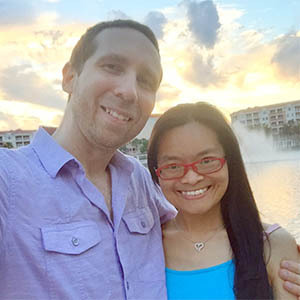 Damon and Rita are the creators of Starting Curve, a blog about empowering creative individuals to pursue their dream and build a real online business. When not working, they enjoy experimenting in the kitchen, watching scary movies and traveling by train.